LMT’s ‘The Pool” offers something for everyone - Times Publishing Newspapers, Inc.
Lower Makefield Township’s Aquatics Complex, known simply as “The Pool,” is a premiere summer recreation facility located within Community Park at 1050 Edgewood Road in Yardley. Voted the most Happening Pool in Bucks County for four consecutive years. The resort-style pool complex includes four separate swimming pools that accommodate everyone from the competitive swimmer to the family looking for a place to swim, play and relax. 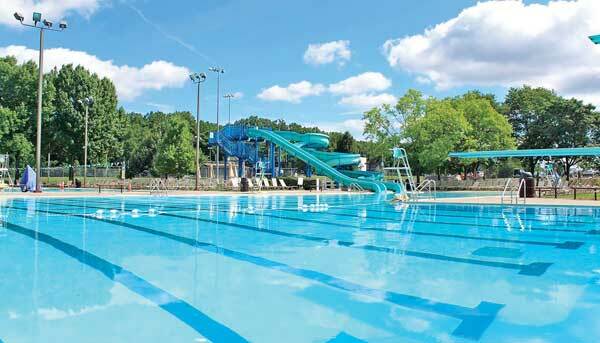 Be prepared to slide into adventure down the two water slides, dive off one of the only high dives in Bucks County, swim laps in dedicated lap lanes or enjoy the snack bar. The Pool has many amenities for everyone. Any pool complex would not be complete without a number of activities, regular entertainment and theme nights scheduled throughout the season. A variety of membership options are available. Register online today at www.lmt.org.